Hand Made Roses for all the loves of my life! Trim ends off washed zucchini then chop or slice roughly. Strain out and immediately refresh in very cold water. Drain, place in a deep beaker and whizz till smooth using an immersion blender. Set aside. Place the milk to heat in a small sauce pan while in another pan you cook the butter and flour, whisking them together to make the base. When the milk comes to the boil take both pans off the heat and pour all the milk at once onto the base, whisking hard with a large whisk to blend the two into a smooth and lump free white sauce. Should lump forms don’t worry, just strain the white sauce through a sieve. Season with salt or if you prefer with plenty of freshly grated nutmeg and about ¼ cup of grated Parmigiano-Reggiano. Prepare a wide shallow pan into which you place cold milk to come about an inch high. Prepare a buttered baking dish and pre-heat the oven to 90 °. Roll up each in piece into a cylinder and cut into two or three even sized rolls between 1 inch and 2 inches high. Place them close together cut side up in the buttered baking dish continuing the process till it is full – if you have space left use crumpled balls of cooking foil to fill in the space and keep the rolls upright. I like to use kitchen scissors to nick the rolls in a few places and pulls out pasta “petals” turning them down a little so they stay “open” during baking. Melt 2 tbsp butter and drizzle this over the top of the roses, or to save calories, simply brush the tops with milk using a pastry brush or a couple of rolled up sheets of strong kitchen paper. You can also sprinkle with extra just-grated Reggiano if you like. Bake at 90° for about 30 minutes or till the top of the roses is crisp and golden then serve placing vertically or horizontally on individual plates as you prefer. 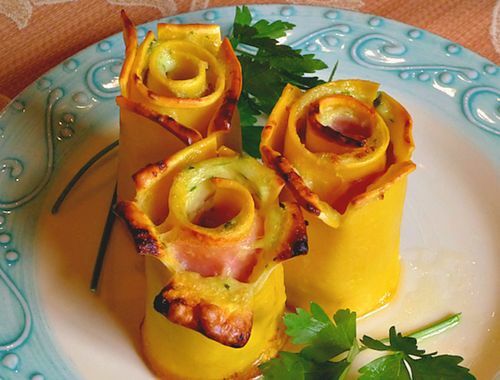 Variations: Leave the vegetables out altogether for the traditional recipe or use alternative vegetables, in a puree as above or simply placed on top of the ham. 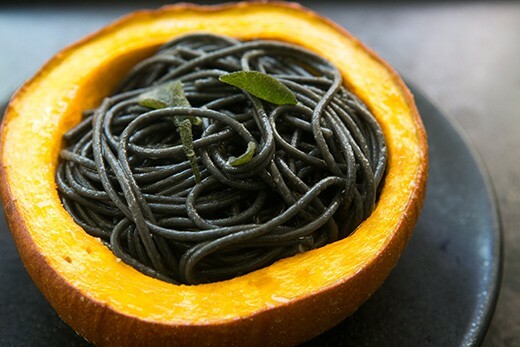 According to what is in season, cooked mushrooms, asparagus, leeks, fennel, artichokes, blanched Swiss Chard leaves all work well..
Squid ink pasta typically comes as either spaghetti or linguine; we made ours in casarecce which will work fine also. Dust the insides of the pumpkin with a little sugar, just to accentuate the sweetness of the pumpkin. You can use either brown or white sugar, or skip it all together. Preheat the oven to 350°F. Slice off the top quarter of each pumpkin and scoop out the insides. Using a strong metal spoon or a small sharp knife, scrape all the fibrous insides out of the pumpkins. Sprinkle the insides of the pumpkins with salt and sugar. Set the pumpkins on a baking sheet and bake for 1 hour, or until a fork easily pierces the flesh and the edges are lightly browned. Prepare the pasta water while the pumpkins are cooking. Bring a large pot of well salted water (it should taste like the sea) to a boil. When the pumpkins have about 10 minutes to go before they’re done, add the pasta to the boiling water. When the pumpkins are cooked remove from the oven to a serving dish or plates. While the pasta is cooking, prepare the browned butter sauce. Heat the butter in a sauté pan over medium heat. Add the sage leaves and cook until browned bits begin to form in the butter and there is a lovely nutty aroma. Remove any whole sage leaves you are using for garnish. Remove the pan from the heat and pour the browned butter into a large serving bowl (this will stop the butter from cooking further). Browned butter can easily turn to blackened butter, which is not the flavor you want for this recipe. When the pasta is ready (al dente, slightly firm, but cooked through), use tongs to remove the pasta from the pot to the large bowl with the browned butter. Allow some of the water from the pasta to drip into the bowl, it will help with the sauce. Toss the pasta with the browned butter. Splash a little cider vinegar over it. Taste for salt, it will likely need a bit more, especially if you’ve used unsalted butter. Add more if needed. 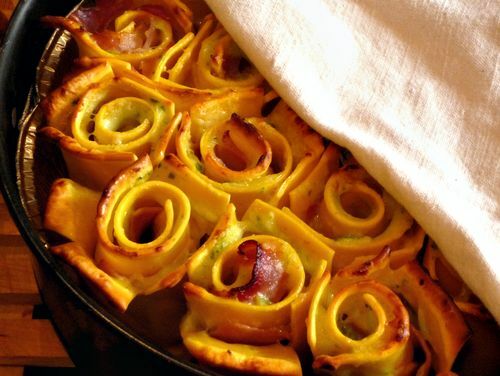 Serve the pasta in the baked pumpkin shells. Garnish with reserved whole sage leaves that you had cooked with the sliced sage in the butter. I love this dish served with fresh fish or clams. It is so easy to make and only takes 10 minutes from start to finish. 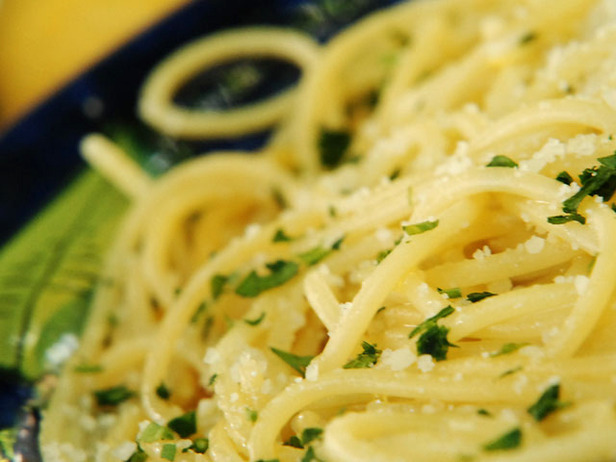 If you like a lot of lemon flavor use our lemon and garlic linguine. Place the fresh linguine in a pot of boiling salted water and stir immediately to prevent the strands from sticking. Cook pasta to al dente’. Cut the garlic in half and rub the exposed area along the interior of a large serving bowl. The raw garlic flavor will coat the inside surface of the serving bowl. Discard the garlic. Add the freshly squeezed lemon and slowly drizzle in olive oil while whisking. Whisk until the ingredients have emulsified. Mix in the salt and parmesan cheese. When the linguine is ‘al dente’, drain and add to the serving bowl. Mix the pasta with the lemon sauce to coat evenly. Sprinkle the pasta dish with parmesan cheese, fresh parsley and lemon zest. Serve immediately. Pasta for Dinner or Dessert??? Yes I know, that I am crazy (mash potato fudge and chocolate pasta with chilli sauce) but this was a big hit for desert the other night! Now that I make and sell pasta 24/7 (at least it feels that way) I always have fresh pasta around the house and thought a desert might be good with some of the lemon fettuccini I made last week. Besides, pasta is made from flour and eggs, the basis of Western pastries, so there is no reason why it shouldn’t work. I decided to give it a try. 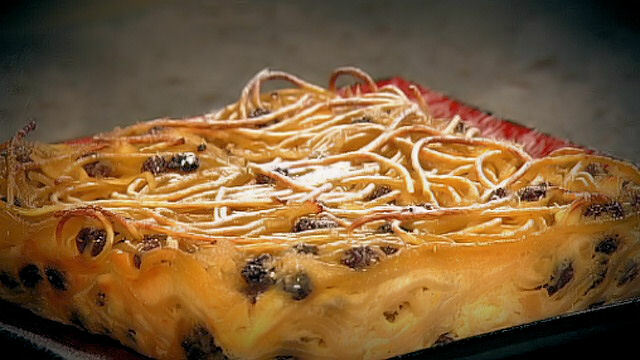 I have also included a second recipe where I cooked the pasta into a cake. Enjoy! In a large heavy skillet heat the cream, zests, honey and salt over medium heat, being careful not to boil the cream. Stir occasionally for about 4 minutes. While this is cooking add fresh pasta to boiling water and cook for 2 to 3 minutes. Drain pasta and add to skillet. Add lemon juice and stir to combine. Place on severing dishes, add shaved chocolate and hazelnuts. Place the raisins in a small bowl and pour over the Amaretto liquor. Leave to soak for 10 minutes. Peel, core and coarsely grate the apples. Place in a bowl and squeeze over the lemon juice (so that they do not turn brown). Line a 8 x 8 cake pan with baking parchment and lightly brush with oil. 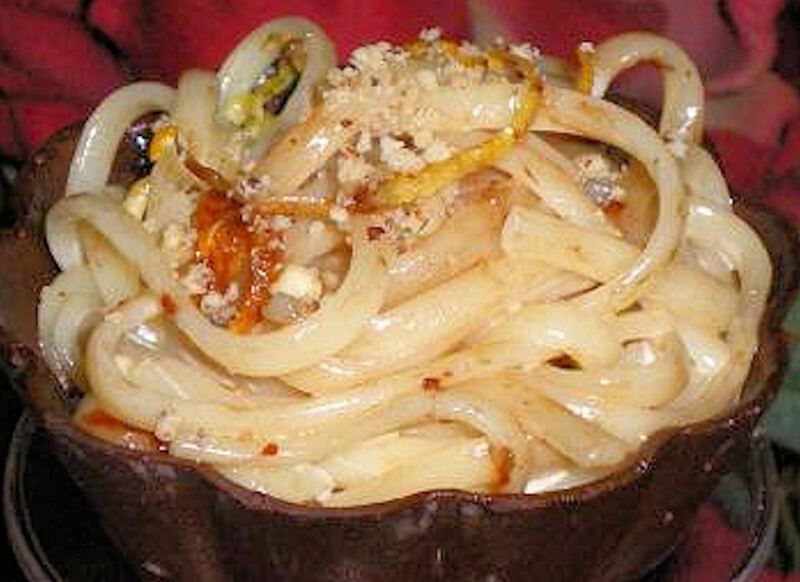 In a large saucepan, cook the linguine in the salted boiling water. Drain and rinse under cold water. Set aside. Meanwhile, in a large bowl lightly beat the eggs with the sugar. Add in the almonds, the orange zest and the raisins with the Amaretto liquor. At last fold in the pasta and the grated apples. Pour the mixture in the cake pan, cover with foil and bake for 40 minutes. Once the 40 minutes are up, remove the foil, sprinkle with sugar and continue to bake for a further 10 minutes until lightly browned and crispy on top. Let cake rest for 15 minutes before cutting. Gently sauté garlic, red bell peppers, breadcrumbs and walnuts in 2 tablespoons of olive oil, just until toasted, add lemon zest. In the meantime bring a large pot of salted water to a boil. Add broccoli. When water comes back to a boil add pasta. Cook for 3 minutes. Ladle cup of pasta water into bowl with raisins. The word broccoli comes from the Latin word brachium and the Italian word braccio, which means “arm”. Broccoli is a part of the cabbage family. Eating broccoli reduces the risk of coronary heart disease and death in postmenopausal women. A compound found in broccoli appears to have more effect than modern antibiotics against the creation of peptic ulcer causing bacteria. Broccoli is a cool-weather crop and grows poorly in the summer. Eating Broccoli Regularly Reduces the Risk of Cancer. Research has shown that eating broccoli regularly can reduce the risk of prostate, colon, breast, bladder and ovarian cancer. Broccoli’s dark green color contributes to its cancer-fighting properties. Broccoli Combats Eye Disease. Broccoli contains a high concentration of lutein, a valuable antioxidant that promotes eye health, prevents cataracts and protects against macular degeneration and other chronic eye diseases. Broccoli Promotes Bone Health. Broccoli is a potent source of calcium, and as such helps promote strong bones and teeth. You can eat as much broccoli as you like and not gain weight because it has only 3 calories from fat per cup, unlike other sources of calcium. Broccoli Lowers the Risk of Birth Defects. The risk of birth defects can be significantly reduced by including broccoli in a pregnant or nursing woman’s daily diet. Broccoli contains folate, a vitamin B supplement that helps the baby develop strong bones. Okay now that we have the healthy reasons to eat broccoli here are my favorite recipes. “Drinking cup” is the English translation of the French word “timbale”. Traditional dessert timbales are simply brioche pastry cups filled with a fruity mixture. 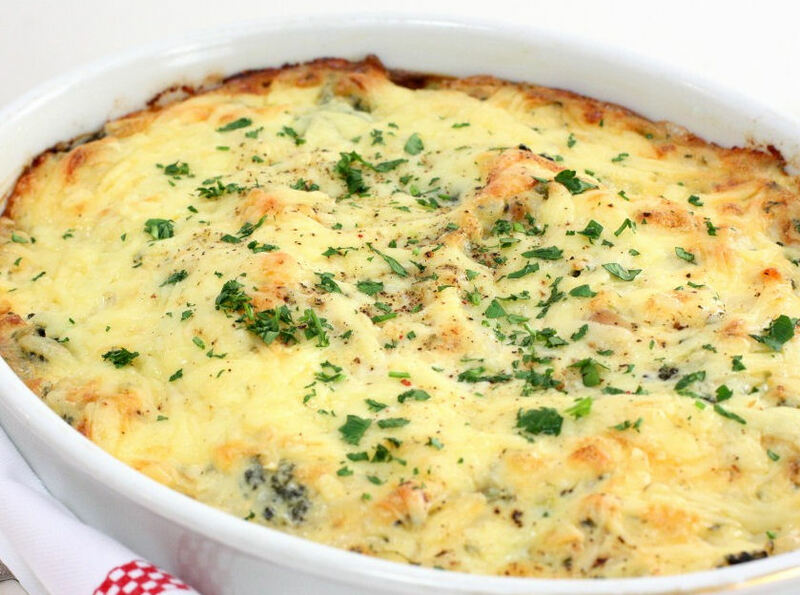 This version of the timbale, a cup-shaped custard with minced vegetables, is a lovely side dish for elegant meals. This recipe allows for about 12 timbales as guests rarely enjoy just one. Melt butter in a large skillet over medium-high heat. Add onions and cook, stirring occasionally, until translucent, about 3 – 5 minutes. Add onions to broccoli in a bowl, and stir until combined. Stir in cheese, salt, and pepper. Preheat oven to 325F (165C). Line 12 cups of a muffin pan with foil cups. Spray cups with nonstick cooking spray. Beat cream and eggs in a large bowl until just blended. Pour egg mixture into broccoli, and stir until combined. Pour mixture into prepared foil cups. Fill a large baking pan halfway with hot water. Set the muffin pan inside the pan of water and place on lower rack of oven. Bake 35-40 minutes or until knife inserted off-center of timbale comes out clean. Remove from heat and cool for 10 minutes. Remove timbales from muffin pan and gently peel away foil cups. Place upside down on a serving platter or individual plates and garnish with a shaving of Parmesan. Store covered in the refrigerator for up to 2 days. These timbales can be made 1 day in advance and reheated when ready to serve. After timbales have fully cooled, remove them from pan, keeping timbales in their foil cups. Place timbales on a plate, cover with plastic wrap and refrigerate. When ready to serve, gently peel foil cups away from timbales and place upside down on a baking sheet. Warm timbales in a 350F oven for 10 minutes. Or, place timbales upside down on a plate and microwave until warm. Place timbales upside down on serving plate, garnish, and serve. Bring a large pot of water to a boil. Add salt. Meanwhile, separate broccoli florets from the stalks (or peel the broccoli stems and cut into small cubes.) Add the broccoli to the boiling water and cook until tender but still bright green, about 5 minutes. Remove broccoli with slotted spoon. Add pasta and cook to desired doneness. Drain reserving 1 cup of the pasta water. In a small skillet, heat olive oil over medium heat and add garlic and hot pepper flakes. Saute until garlic is fragrant, about 1 minute. Add drained broccoli. Mix in ricotta cheese and pasta, until sauce is creamy. If sauce is too dry, add as much pasta water as desired to get a creamy consistency.